THE ADDRESS is an elegant coffee table magazine that curates a luxury lifestyle guide for the good life. International luxury real estate, food and travel blend effortlessly in this lavish publication. Inside the magazine’s 554 glossy pages is a visual feast – every story comes with a cornucopia of high-quality photography along with well-crafted writing. From luxury resort homes with no-hassle turn-key ownership on idyllic islands to exclusive new golf properties in areas of great natural beauty; from the ultimate in city living to perfect weekend getaways and mountain homes, browse THE ADDRESS Magazine and discover a range of luxury properties for sale, from elegant apartments to prestigious family homes for sale throughout the world. In this Special Travel Edition, the luxury food and travel magazine combines our readers’ love of luxury, adventure, and gastronomy. We cover the unique and finest in food, best bites, chefs, artisans, and inspirational travel including some of the best holiday rentals and vacation homes to rent. Do not miss our ultra-modern golf property for sale in Spain, which epitomises contemporary sophistication and elegance within stunning, polished architecture and interiors. With immense style, elegance and true brilliance, the captivating modern golf property was designed by renowned architect Richard Hywel Evans (Studio RHE). Exceptionally located in a coveted lifestyle address, it is situated at PGA Catalunya Resort, Europe’s leading villa resort. For your luxury real estate purchase in Provence and the purchase of a Provencal-style bastide, our impeccable bastide villa for sale in Mougins is a true pièce de résistance. A select haven of exclusivity and elegance, the exceptional Provencal bastide property exudes refined beauty and generous comfort in a scenic and private setting. This peaceful oasis offers a truly privileged living environment in which understated sophistication and timeless beauty produce a quality of life that is at the heart of the enduring charm and appeal of South of France. Looking for a property in the French Alps? Have a look at our new luxury ski chalets for sale in Montchavin La Plagne. With stylish accommodations, state-of-the-art amenities and fine living spaces, this premium ski property is an exclusive and elegant interpretation of traditional Alpine lifestyle. snow-capped mountain peaks set a glorious backdrop, and each mountain home comes with outdoor space for maximum enjoyment and lovely views. Now might be the perfect time for you to take a look at the beautiful Greek Islands for that vacation home you have been dreaming about. This wonderful collection of luxury holiday homes for sale in Samos, Greece offers casual elegance, timeless charm and modern comfort. Complemented by a host of luxurious on-site facilities too, the attractive Greek property comes with all the advantages of owning a second home in the sun, and the carefree experience of staying in a luxury resort hotel. Algarve is considered one of the world´s best places to live. The warm, sunny weather, stunning beaches, gorgeous surroundings, world-class golf, and high quality lifestyle attract lifestyle investors from all over the world to invest in luxury Algarve property for sale. This issue of THE ADDRESS Magazine features a high-quality selection of luxury Algarve second homes for sale including a luxury property for sale in Albufeira Guia Algarve with stunning Moorish design and a modern villa for sale near Penina Golf Portimao complete with sleek aesthetics. PGA Catalunya Resort, one of Europe’s most acclaimed residential resort developments, offers a decadent collection of luxury properties for sale near Girona. A lifestyle to covet, here owners are surrounded by designer elegance, pure luxury and outstanding natural splendour. Championing both world-famous and up-and-coming national and international architects with a sleek design concept that makes the most of the resort’s beautiful surroundings, the spacious villas, semi-detached villas, townhouses and apartments epitomise modern living at its best. THE ADDRESS Magazine is a showcase of some of the best modern houses for sale in Catalonia near Costa Brava including a stunning architect-designed golf property for sale at PGA Catalunya Golf, a spectacular golf property for sale on the prestigious PGA Catalunya Resort, immensely attractive PGA Catalunya properties for sale, stylish PGA Catalunya Resort properties for sale and contemporary golf villas for sale at PGA Catalunya. A picturesque town with Old World character and quiet elegance, Mougins is perennial favourite amongst discerning buyers of properties in South of France. Located in the heights of Cannes and a 15- minute drive from the center of Cannes, Mougins is an attractive town that name drops Yves Saint Laurent, Catherine Deneuve and Picasso as past residents. It is pleasantly Provencal, with a maze of winding streets and cobbled squares, vibrant markets, splendid views of the French Riviera, Michelin-starred restaurants, and quaint cafes. Golfers enjoy Mougins because it boasts two 18-hole courses: the Royal Mougins Golf Club and the Golf Country Club de Cannes Mougins. There are some incredibly beautiful houses and villas for sale in Mougins and its immediate area. 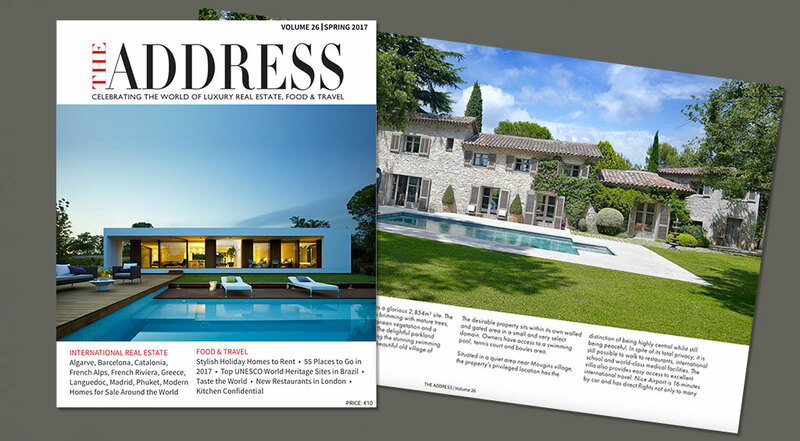 In this issue of THE ADDRESS, readers will find a Provencal luxury property for sale in Mougins that is filled with elegance, timelessness and uncompromising style, as well as an immensely desirable villa for sale in Mougins that comes with a blend of timeless beauty and modern flair. As one of the world’s finest cities in which to live, the city of Madrid offers a cosmopolitan lifestyle that mixes the alluring Spanish charm and a European modernity. With its rich artistic and cultural wealth, world-class gastronomy, modern transport network, high quality of life and the passion with which the locals enjoy the city, it is easy to see why relocating to Madrid is so popular. THE ADDRESS Magazine showcases some luxury properties for sale in Madrid including an elegant apartment in Barrio Salamanca Madrid for sale with a prestige address, an exclusive La Moraleja property for sale in Madrid filled with modern grandeur, a prestige apartment for sale in Justicia Madrid that possesses classic distinction and elegance, a contemporary villa for sale in La Moraleja Madrid hallmarked by showstopping style and elegance, and a modern house for sale in La Moraleja Madrid will make a dazzling statement. Also, in this issue of THE ADDRESS Magazine readers will find an exclusive villa for sale in Barcelona with sensational city views; a rare and stunning townhouse for sale in the old town of Menton with panoramic views, an exceptional wine estate resort property for sale in Languedoc, and a gorgeous collection of premier properties for sale in Layan Beach, Phuket. Many of our readers cannot get enough of the sleek lines, glass walls and geometric angles of a modern home for sale. Have a look at our feature “Best modern homes for sale worldwide” where there are plenty of gems available for design aficionados whose taste in homes is singularly modern. The article “Who should own my property abroad” focuses on one aspect that is often overlooked when buying property abroad. And yet it is of profound importance. Deciding on who should own the property has a major impact on taxes and inheritance and can save large amounts of money. There are many options ranging from an individual, a couple, partly or totally in the names of any children, company ownership, trusts and so on. With increased globalization, more HNWIs are projected to send their children abroad for their education over the next decade. The market insight feature “Investor Migration through Higher Education” covers aspects such as drivers for overseas education and World University Rankings. If you are looking for inspiration for your next holiday, our special International Travel Magazine edition has selected the best destinations for 2017. From ancient temples to crystalline waters, here are our 55 top destinations to visit this year. Choose one, or choose them all – whatever you do, happy adventuring! If you are looking for a luxury holiday home to rent, do not miss THE GREAT ADDRESS’ curated collection of exceptional vacation rentals. From French Riviera to Phuket to Provence, this issue will introduce you to a few of the most prestigious mega luxury rentals in their impeccable collection. No holiday to South Africa is complete without a safari in the Kruger Park. For an unforgettable adventure, read our feature “Kruger Park: A Glorious Spectacle of Magnificent Wildlife and Scenic Beauty”. With a veritable kaleidoscope of things to see and do, Mumbai never fails to mesmerize its visitors. Our Insider’s Guide to Mumbai article is loaded with information to help you visit and explore this expansive and vibrant city like a true local. Brazil’s natural beauty – from the epic coastline to its tropical rainforests – has always been one of its greatest lures. Home to incredible food, beautiful beaches, rich wetlands, dense jungle and cultured cities, Brazil is fast becoming one of the most visited countries in South America. Here are our 12 top UNESCO World Heritage Sites in Brazil. Restaurants try to stand out not just based on what is on their menu, but sometimes on the design and the ambience of the establishment as well, making it not just a meal but a complete sensory experience. With an epicurean travel magazine angle, THE ADDRESS invites our readers to discover 13 one-of-a-kind dining experiences from around the globe. London is a city brimming with creative energy and culinary innovation. There is always an exciting restaurant opening to look forward to. From the most beautifully designed to the ground-breaking culinary innovation, here are four of the best new restaurants in London. THE ADDRESS Magazine has had the privilege of sitting down with a number of interesting, influential chefs and food-drivers in the international culinary community. In this issue, Shaun Rankin, Executive Chef of Ormer Mayfair at boutique hotel Flemings Mayfair London talks to THE ADDRESS Magazine about highlights of his career, top kitchen secrets, culinary philosophy and much more. Shaun Rankin also shares his impressive sea bass poached in confit lemon butter recipe, as well as how to bake the perfect treacle tart – a truly magical treat. Journey in style with our curated list of holiday must-haves, for that perfect getaway. In this issue, we have hand-picked our favourite travel companions and holiday discoveries; essential items guaranteed to keep you looking fresh and fabulous from take off until touchdown… Bon voyage. Finally, explore our photo essay “The colourful kaleidoscope Cuba”. Cuba’s alluring colonial cities are a visual feast of faded elegance, bustling street life and vibrant culture. The continuity of the past with the present, and a spectacular backdrop of lush rainforest, white beaches and coral reef, makes Cuba an indescribable and extraordinary experience. Click the link to enjoy the latest issue of THE ADDRESS Magazine, celebrating luxury homes for sale around the world along with inspirational food and travel articles.